On 15 February 1864, Gerard Heineken for the first time put his signature to a press notice. The substance of the notice was that the Company De Hooiberg was being dissolved and the brewery was being taken over by Gerard A. Heineken. Gerard asked his readers to take note of his signature. At the time he could hardly have suspected that 150 years later his signature – his name – would be familiar in all corners of the world, but even then he certainly had high ambitions. Three years after the takeover of the brewery De Hooiberg, Gerard dared to present his beer to an international public at a major international exhibition in the new Paleis voor Volksvlijt [Palace for Popular Arts and Crafts] in Amsterdam. Although he was awarded a medal, his conclusion was emphatic: ‘Hollandsch bier’ had to go, for “Bavarian beer” was the future, a modern bottom-lagering beer that was becoming the international fashion. 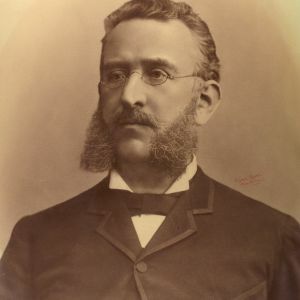 In the board meeting of 4th January 1873, Heineken and his brewmaster Feltmann explained that Hollandsch bier was no longer profitable; so the meeting decided to stop its production. 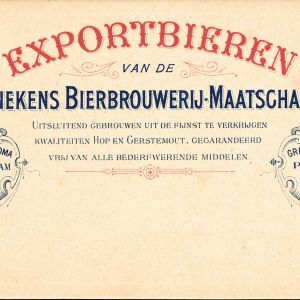 Henceforth it was to be exclusively Bavarian beer that was brewed in the brewery on the Stadhouderskade. Messrs. Vollenhoven & Co would take over the stocks of ‘Hollandsche barrels’ including the old clientele. On 17th February 1873 Gerard Heineken proposed to his fellow directors that they should participate in the World Exhibition to be held in Vienna on 1st May, to be opened by the Austrian Emperor Franz Joseph. It was decided to send ‘a sufficient quantity of beer of the best quality’, but at the next meeting it was noted that there was insufficient time to construct a stand before the stipulated date for exhibition entries. No beer was sent to Vienna, but Heineken sent his brewmaster to see what was of interest for their own enterprise. 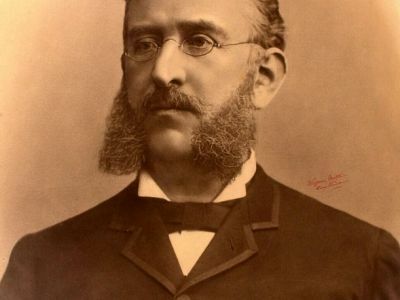 In the summer of 1873 the reputation of Heineken beer reached the South of France, where Monsieur Allebé of Bordeaux requested an agency for Southern France. 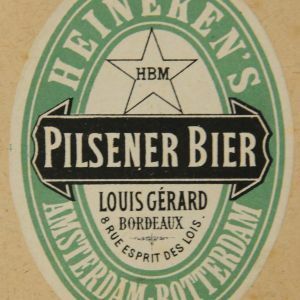 Ever since, Heineken has been a favourite beer in France and by 1885 Heineken had become one of the largest importers. But Gerard wanted to go beyond the borders of Europe. 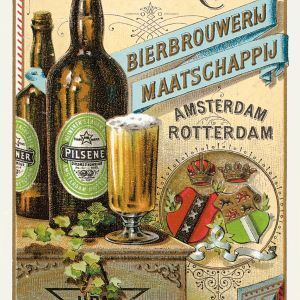 In 1874, with a view to exporting beer to South America, Heineken conducted a test in the new brewery in Rotterdam to see if it was feasible to pasteurize beer. The result was positive and overseas export began. 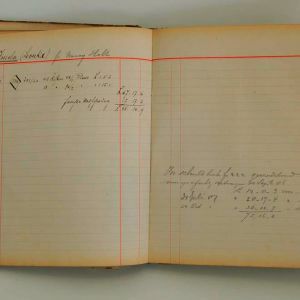 The oldest surviving export journal begins in 1883. In February of that year 50 cases with 96 half bottles (32 cl.) were sent by the steamship Albingia to Panama. In September of the same year there were another 81 cases of the same. The following year 30 cases went to Havana, 30 to Jamaica, 15 to Rio Grande do Sul, 30 cases to Berbice, and further to Santos, Rio de Janeiro, Caracas, Buenos Aires and Valparaiso. All the beer that went abroad (at least, further than Belgium) was bottled, either in whole bottles of 64 cl. or half-bottles of 32 cl. 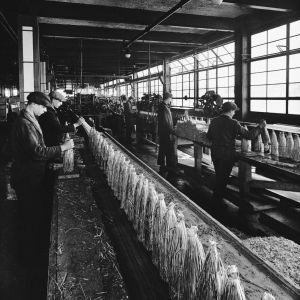 The bottles were packed in cases of 48 whole bottles or 96 half bottles, with protective straw packing. 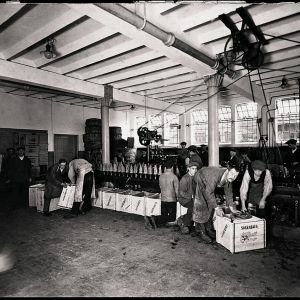 In the beginning bottles were corked, but it was found that cork could dry out over a long sea voyage leading to leakage, or air getting in and causing deterioration, a situation that Heineken could not of course tolerate. 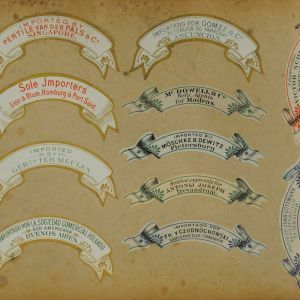 In 1880 bottles were for the first time capped and a year later the five-pointed star appeared on the cap making it clear to everyone where the beer was coming from. Three kinds of beer were exported: Vienna, Bavarian and Pilsener, all three bottom-fermenting lager beers named after their places of origin: Vienna, Bavaria and Pilsen. 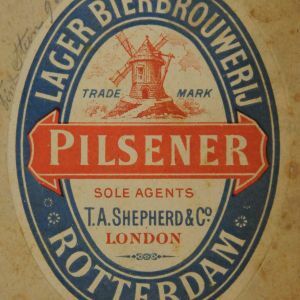 Officially, the latter should have been called ‘Pilsen beer’, but according to brewmaster Feltmann this would have been confusing and so he had ‘Pilsener’ put on the labels. Export was by no means limited to South America. Gerard sent his beer all over the world: along the coast of Africa beer was delivered to Accra, Cape Town and Zanzibar. Even further afield it went to Colombo, capital of the newly created British Crown Colony of Ceylon, and in 1885 to Rangoon, which had become the capital of the then British Burma; also to Tientsin, the old Chinese port for Beijing, which had opened up for trade with the outside world in 1860, as well as Shanghai and Hong-Kong. And in the ‘Royal Hotel’ in Levuka in the Fiji Islands, the oldest hotel in the Pacific, the tourist could already drink Heineken beer. In 1885 40 cases with whole bottles and 10 cases of half bottles were delivered there for around £85. Crucial for this export trade were reliable agents and business houses. Exports to South America were largely in the hands of German agents and commissioners such as the firm A.G.W. Hamman from Hamburg. For deliveries to the far-flung British colonial empire Heineken cooperates with British agents as Messrs. Shephard & Co of London, exclusive agents for Marquis deLussac champagne and Heineken’s bier. The last export journal ends abruptly in March, 1893, at the same time and with the same abruptness as the death of Gerard Heineken. It appears that Gerard himself kept this journal with its exact record of where his beer was shipped to. He had four model ships standing in his workroom, no doubt models of the ships that transported his beer all over the world – quite possibly the steamship Albingia, or Eldorado.